H. E. "Buddy" Engelhorn sent email about his duty at Operation Hardtack. Thanks for the reply. I belonged to an Atomic Veterans group back in the early 70's then stopped hearing from them. About 6 years ago, I moved from Baton Rouge La. to Bay St. Louis Ms. so I lost contact all together. They sent out a nice news letter that I enjoyed reading. 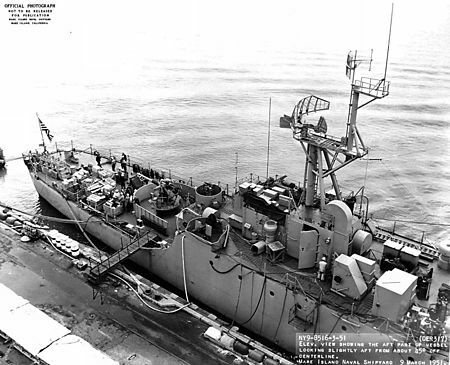 I served as a Quartermaster 3rd, class [also signalman] aboard the USS Joyce DER 317 1956-58. As best I can recall, we left Pearl Harbor, Hawaii for Eniwetok Atoll in the Marshall Islands and in June & July, took part in the Atomic weapons tests conducted there. As each bomb was set off, I remember the bright flash, then the [boom] sound as it passed over the ship. The sky became somewhat dark and the sea became very rough. A second [boom] travelled underwater and struck the hull of the ship. A few hours after the blast, we would see barges of dead animals passing our ship with horses, cows, goats etc. We also saw naval ships and submarines at ground zero that were broken apart like toothpicks from the Atomic blasts. One day a bomb was set off and we were very close to it. More close than usual. As the dark radiation cloud went up into the sky, the wind shifted and blew it right over our ship and we could hear particles of the radiation raining down on our ship. It sounded like tiny particles of metal striking our metal deck. We were ordered to strip down all of our clothing which was placed in large plastic bags and thrown over the side [deep sixed]. We were then showered on deck and checked for radiation with some type of detector. Upon leaving the test site, we were stood in line to have our Dosimeter Badges checked and then we were to place them in a box at the end. Because they said my reading was a little higher than normal, I kept mine and still have it today. One of my jobs as QM-3 on the Bridge was to notify the Captain when all decks were clear and all of the crew was inside with doors and hatches battened down. This may explain why my dose was a little higher as I had to stay outside longer after a blast. I remember upon leaving Hawaii, no one was to know where we were going and all radios and cameras were picked up. Then the Officers conducted a search of all personal lockers and all throughout the ship. Of course being a Quartermaster and plotting the ships position and course on the charts I knew where we were headed but could not tell anyone.